LTE-M1 System Bandwidth is always 1.4 Mhz, but legacy LTE System BW with which LTE-M1 operate can be wider than 1.4. When LTE-M1 operate in a wider legacy LTE band, it split the wider band into multiples of 1.4 Mhz band slot and use any one of those slots. These 1.4 slot for LTE-M1 is called 'Narrowband'. How many Narrowbands are there for each System Bandwidth ? 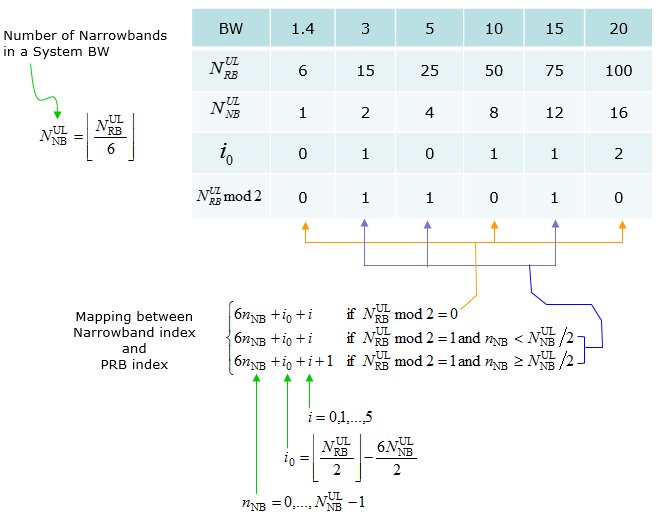 How to figure out which Narrowband to be used ? The way in which narrowbands are devided and indexed is specified in 36.211-5.2.4. Based on 36.211-5.2.4, following table can be created. How a UE can figure out which Narrowband to be used for transmission or reception ? The answer varies depending on situations. The brief summary of the case and Narrowband determination is as follows.